Labline® mechanical joint and Enfield® Enfusion electrofusion polypropylene acid waste systems are capable of handling a variety of corrosive chemicals and pH levels found in various chemical waste applications. Polypropylene acid waste systems are available in schedule 40 and schedule 80 1½” to 4” mechanical joint and 1 ½” to 12” fusion joint sizes. With Enfield® electrofusion polypropylene acid waste fittings, a heavy-gauge resistance wire made of chrome / nickel alloy is integrally molded into the socket using a proprietary injection molding process. The wire is heated by a microprocessor controlled fusion control unit, which creates a high-integrity bond between the pipe and fitting – in a matter of minutes. 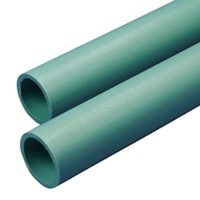 Approved for acid waste applications in accordance with NSF, CSA, IAPMO, SBCCI, ASTM F1412, Enfield® electrofusion polypropylene acid waste systems are available in Schedule 40 and Schedule 80 pipe sizes from 1½" to 12" IPS. Both flame-retardant and non-flame-retardant pipe is available.